Find your Settings by clicking your avatar in the top left corner of Front. From here you can customize your workspace and account preferences to best fit you. Here's an overview of what you'll find in each menu. Change your username, account password, or enable two-factor authentication. Connect an email address or another account to sync with Front — it will only be visible to you, not your team. Automate repetitive tasks for your individual inbox, like sending auto-replies or tagging messages based on the sender or keywords. Create or delete private tags (you can tell when you use a private tag by whether it has a lock symbol on it). Change your Front workflow options — choose the default email address your messages are sent from, make Front your default email client, set your snooze timing options, and more. Create or edit your private canned responses (which only you can use) or set your vacation auto-responder. Create a signature for every occasion — Front designates the first signature as the default, so make sure the one you usually want to use is at the top. 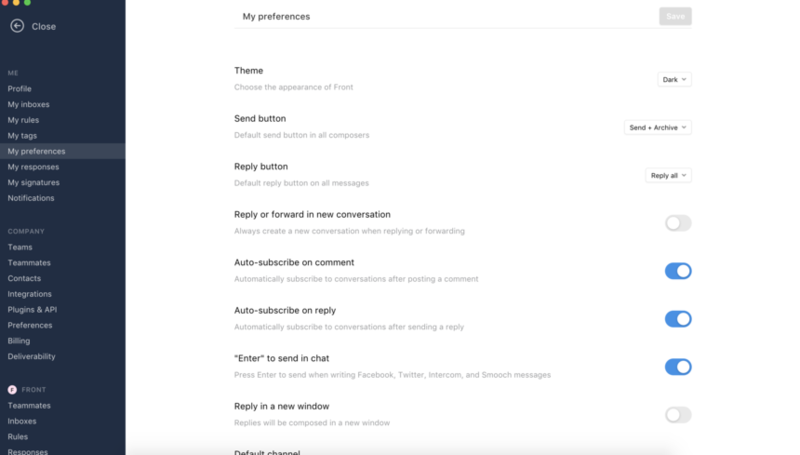 Enable desktop notifications, mobile push notifications, or email notifications for activities you care about, like being mentioned in a comment or receiving a new message. Change the appearance of your navigation and settings panel. Choose between a light or dark theme. Choose between 'Send' or 'Send + Archive' as your default send button behavior. Choose between 'Reply' or 'Reply all' as your default reply button behavior. If you want every reply or forwarded message to be tracked as a separate conversation enable this setting. If enabled, automatically subscribe to a conversation after posting a comment on a conversation. Any additional activities on the conversation will resurface it back in your Inbox. If enabled, automatically subscribe to a conversation after replying to a message on a conversation. Any additional activities on the conversation will resurface it back in your Inbox. If enabled, automatically mute conversations when you move them from your private inbox to a team inbox. Any additional activities on the conversation will not resurface it back in your Inbox. Only an @mention will resurface the conversation back into your Inbox. If enabled, automatically mute conversations when you unassign a conversation from yourself. Any additional activities on the conversation will not resurface it back in your Inbox. Only an @mention will resurface the conversation back into your Inbox. Chat channels like Facebook, Intercom, and Smooch have light-weight composers that allow you to respond quickly. Enabling this preference will make it so your messages are sent when you hit 'Enter'. Replying to a message will pop out an external composer. The channel you set here will be used whenever you reply to a conversation. Allows you to leverage the Gmail shortcuts in tandem with Front shortcuts. If we think you meant to add an attachment but didn't, we will alert you. Always surface a confirmation when you send an email to more than 10 recipients. When the conversation you are on disappears (archive, sent), determine the conversation you want to see. The one above or the one below it. If enabled, attachments will also be printed when printing a message. Determine which snooze timings to display in your snooze/reminder menus. Determine which sent later timings to display in your send later menus. Choose when messages are automatically marked as read. Send data to Front to improve the performance of your app. We will use this when you store a phone number without a prefix.